"Help! 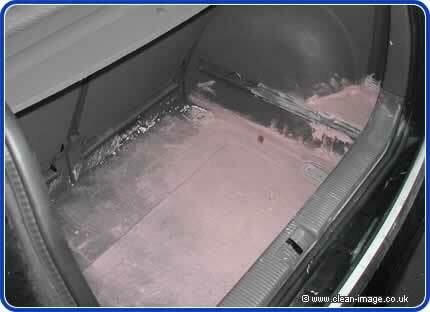 Iv'e spilled paint in the boot of my car!" 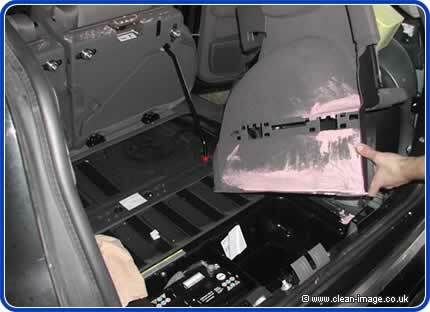 We see this problem all the time, it's caused when you put a new tin of paint in the boot of your car in hot weather, the heat makes the contents of the tin expand and the lid pops off, or the tin tips over and the weight of the heavy paint opens the lid. The first thing to remember is to never leave a tin of paint or wood stain/paint in your car in hot sunny weather, and always keep tins of paint in a well sealed bag regardless. But should you find that it's too late to follow this advice, then don't worry because it's not the end of the world. Unless you have an extractor system (wet vacuum cleaner) it's probably best you do not try and clean up this mess yourself, you may only make things worse. Trying to mop up the spill may spread it, and adding water to it in order to wash it off can add to the problem. Adding a litre of water to a water based paint means you have an extra litre of paint do deal with.. plus adding water may actually cause it to dry more quickly as you are thinning it down. The best thing to do is to find an old towel or blanket which you no longer need and make it very damp (not dripping wet), then cover the paint spill with the blanket. This will soak up some of the paint and stop it moving about, but more importantly, the dampness in the towel will stop it drying. It's far harder to remove paint from carpets once it has dried (although not always impossible). The next thing to do is to phone around your local valet services to find a company which can deal with this kind of problem, preferably in the shortest time.